Minimum 3 to maximum 50 members. You can compose a party without level restriction within same clan, but other clan members cannot join the party in this case. Also, bonus EXP from the party does not apply. Go to the 'Inn hostess' at Main Castles (Karus: Luferson Castle, El Morad: El Morad Castle). Window at left appears once you select the Hostess and right-click. Click "Create Clan". Put the clan name you want and press OK.
Clan is created for 500,000 Noah after clicking OK.
You can check that clan has been created if you open character screen as the right. 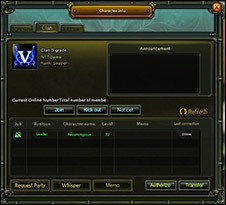 If you input " /Withdraw Clan" on chatting window, then you will be withdrew from the clan. Clans have 5 grades and it will start from 5th grade when you create one. Training Knight Squad has 3 grades and are able to level up to it when the user's clan grade is over 3rd and also passes level-up test from Luferson/El Morad [Knight Clerk]. The grade will be decided by adding NPs of all clan members with same grade. Accredited Knights have 5 grades and are able to level it up when the users training Knights grade is 1 and also passes the level up test from Luferson/El Morad [Knight Clerk]. Royal Knights have 5 grades and are able to level up to it when the user's accredited knight's grade is 1 and also passes level-up test from Luferson/El Morad [Knight Clerk]. The grade of Accredited/Royal Knight will be decided by adding saved points of all clan members with same grade. This point is implemented from the 'Accredited Knight Squad'. Each clan member can save their own NPs in its clan, and saving point is calculated 'Deposit NP/36'. This NP is used for clan activity such as increasing clan grade and purchasing Mantle.